LOTS OF PUP PLAYFULNESS: 2 years old / 35 lbs. 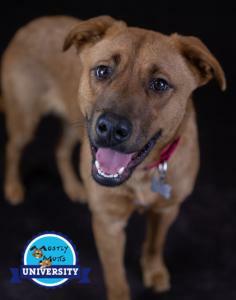 Mostly Mutts adoption center is open Mon-Sat. 11-4pm. Some of us are in foster homes so please call 770-272-6888 1st to find out if I’m available to meet during the week. Hi, my name is Cami! I may be fully grown, but I still have lots of puppy in me, as I love to play, play, and play! All toys are great, as far as I’m concerned, but the ball is my favorite, so…let’s play fetch! My nature is so sweet, and I just love to give kisses and cuddles to my people. I am also showing the volunteers who care for me just how smart I am, because I already know ‘sit’ and ‘come’. I’ve just enrolled in the Mostly Mutts training program, so I expect I’ll learn lots more! Check back soon to see! My potty manners have been really good on the shelter schedule, so hopefully that will be the case in my new home too. I did have some accidents when I had a sleepover at a volunteer’s house, but that was probably just figuring out where the bathroom was. As I said, I have lots of puppy energy still, so I pull some on my leash, and going through doorways sometimes make me nervous, but – since I am a smart girl, I should be able to polish my leash manners with your guidance. I’d like to be active with my family since I’m a higher energy girl. I met a couple of kids at the MM facility and liked them a lot – I was pretty jumpy with them, so kids 10 and older may be a good fit, but best no younger children as I wouldn’t want to knock anyone over in my excitement and playful jumping. And of course, I need to learn not to jump when I’m excited. I also met a few dogs and did very well with them, so if you have a nice playful doggie at home already, let’s meet! I’d likely be too much for older dogs or small dogs since I love to play. I do a bit of digging in the play yard, so if you have a fence, please watch me to make sure I’m not interested in digging out. I met a kitty in my temporary foster home, and I was very interested in her and wouldn’t leave her alone, so likely no kitties for me. While l love the attention and care I am getting at Mostly Mutts, I can’t wait to be in my furever home, so come meet me soon! Energy level: 6-8. I'm current on vaccinations, micro-chipped, spayed, and my adoption fee is $299.00 which also includes an engraved name tag, Martingale collar and leash.